Space Shuttle Discovery touched down for the final time this morning just before noon at Kennedy Space Center. The shuttle has spent a total of 365 days in space and traveled a total of 148 million miles on 39 missions. 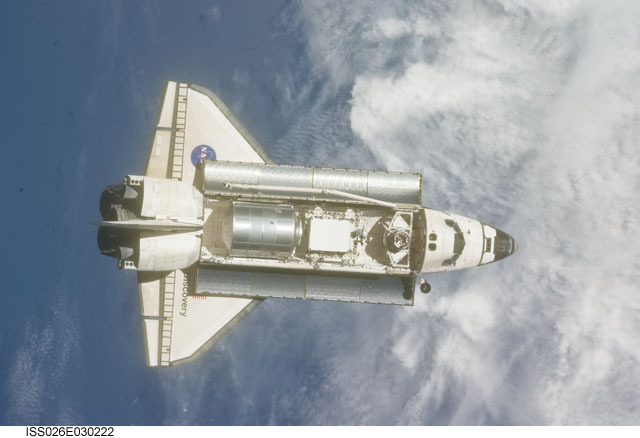 It is the oldest shuttle in the fleet and has always been considered NASA’s workhorse. Universe Today has a post with a crop of great photos from this last mission, as does the NASA website of course. Some cool facts from my own knowledge as well as tweets from Astrophysicist Dr. Neil deGrasse Tyson: the shuttle is traveling roughly 17,500 mph while in orbit, but it’s de-orbit thrusters slow it by only 188 mph. That’s enough to allow it to slowly drop into the upper reaches of earth’s atmosphere, at which point the air begins to take over the slowing process. The drag from the earth’s atmosphere is the only thing that slows the shuttle down from then on, including on the runway because the shuttle has no brakes, just a parachute that deploys just after it touches down. Everything in the re-entry process is meticulously calculated because they only have one chance at it. The shuttle has no power- it’s only a glider once back in the atmosphere, so everything has to be absolutely perfectly executed. The pilot is assisted by lots of powerful onboard computers that take care of most of the difficult fine-tuned adjustments, but the pilot must be able to take over if something goes wrong- the skill level required is immense. On April 12th, NASA is expected to announce the final destinations of the three remaining orbiters after their retirement. Discovery is expected to go to the Smithsonian, but that is not certain until the announcement is made. More on that at Space.com. I feel I must also mention the alien bacteria craziness that happened over the weekend and earlier this week. NASA scientist Richard Hoover had a paper published that claimed that he had found evidence of extraterrestrial bacteria in a meteorite. Well, basically everyone else in the science community is saying he’s wrong, and I’m inclined to agree. There are a host of reasons why his claim is probably bogus, not the least of which is the fact that contamination of a meteorite by earthly bacteria is all but inevitable. Also, the paper had not completed a peer-review process before it was published, not to mention that it was published in a less-than-reputable journal that has a history of publishing error-laden work. NASA even issued a statement saying that they had nothing to do with Hoover’s paper or his claim. Most of this info comes from Phil Plait’s analysis of the situation. Get the whole story from him.